Diving and working in extreme conditions demands consistent and lasting performance from all equipment. Taxing real world environments require the absolute best technology. So we've developed a variety of knives to specifically perform under pressure. 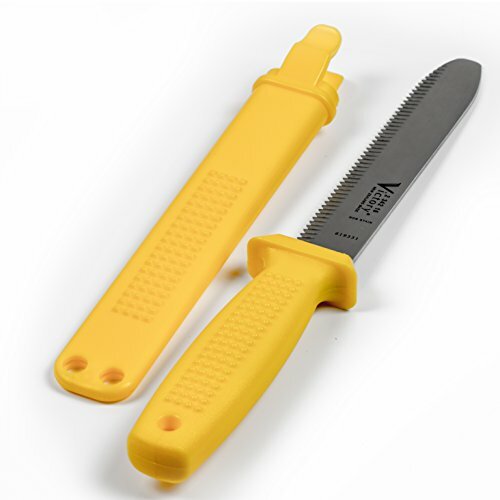 The yellow handled series of Victory Knives are crafted from the highest quality German steel, renowned for centuries of unparalleled durability and strength. After each blade is laser cut from steel, Victory puts the blade through their proprietary heat treatment process. It begins with the furnace being heated above 2000 degrees Fahrenheit. After the furnace soak time the blades are immediately quenched in oil to lock in the grain structure. Following the oil quench each blade is individually Sub Zeroed to -112 degrees Fahrenheit. This gives significant grain refinement and improved wear resistance of the steel alloy. Victory's process along with aggressive blade serration makes for a practical, dependable tool in any marine environment. The serrated underwater range has existed for over 50 years. They are rugged, proven, and loved by the commercial dive world. Depending on personal preference, Victory Knives is making available to you two different ways to carry this series of knives. Victory knives can be bought with either a Leg Sheath (straps included) or a Harness Sheath (carabiner included). This particular knife comes with the sheath, but no straps. If you have any questions about this product by Victory Knives, contact us by completing and submitting the form below. If you are looking for a specif part number, please include it with your message.